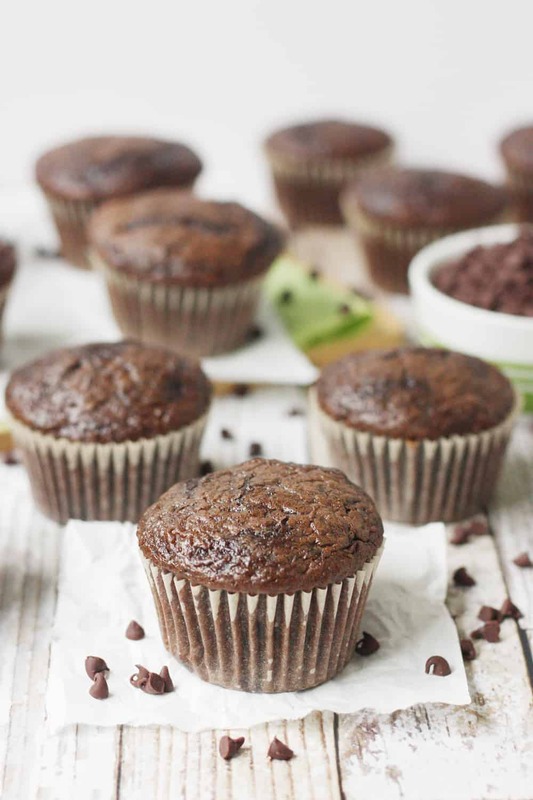 Double chocolate zucchini muffins are easy, moist, and delicious thanks to a decadent chocolate cake mix, mini chocolate chips, and freshly grated zucchini! 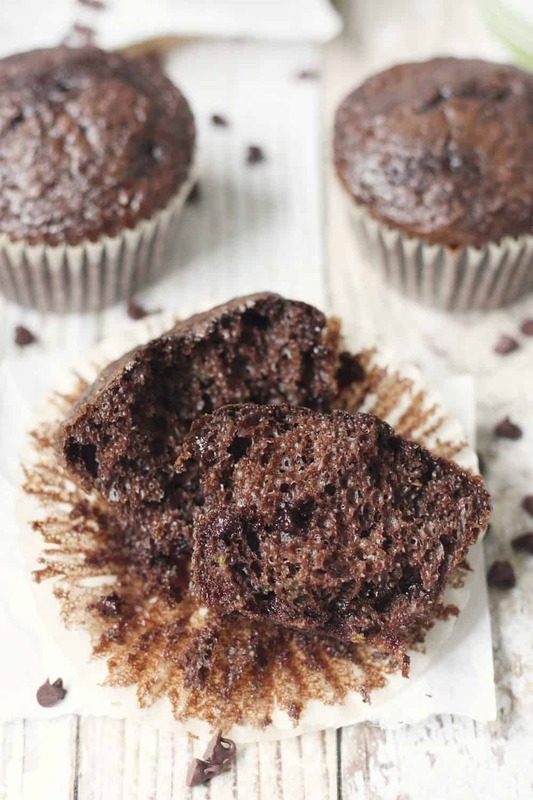 These easy double chocolate zucchini muffins combine so many things I love in a recipe: chocolate, chocolate chips, zucchini, and cake mix. I’m all about doctored cake mix recipes when you get a result as yummy as zucchini chocolate chip muffins. 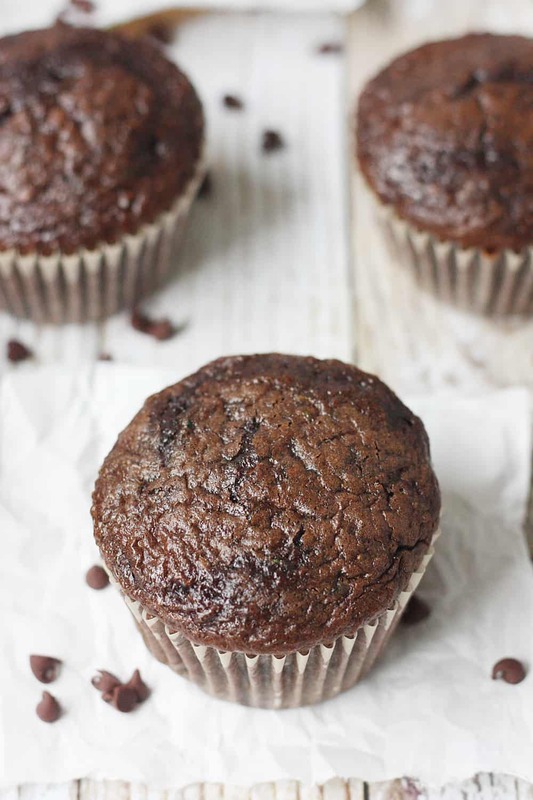 Or should I say chocolate zucchini chocolate chip muffins because there’s a ton of chocolate goodness going on in these babies. Cake mixes can make for some of the yummiest recipes like easy peach cobbler dump cake, cake mix Oreo cookies, funfetti cake mix donuts, easy lemon bars with cake mix, even oatmeal raisin cake mix muffins—a great back-to-school breakfast recipe! I’ve made a few zucchini recipes like blueberry zucchini bread and frosted zucchini brownies (holy yum! 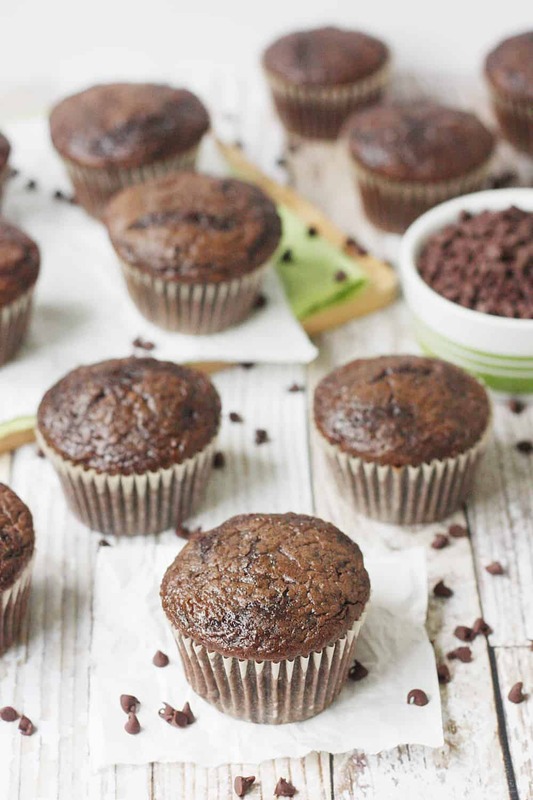 ), but these double chocolate zucchini muffins were by far the easiest. This cake mix recipe requires only six ingredients and about 10 minutes to prep—even less if you use pre-shredded zucchini. What do I mean by pre-shredded? I’m talking shredding a bunch of that garden-ripe zucchini and then freezing it in two-cup portions in quart-size freezer bags. 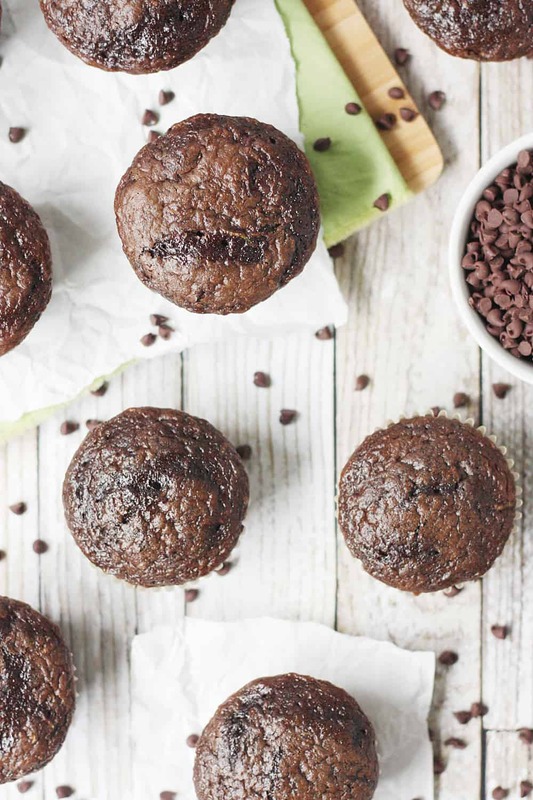 It means you can make all the yummy chocolate chip zucchini muffins you want all year long! 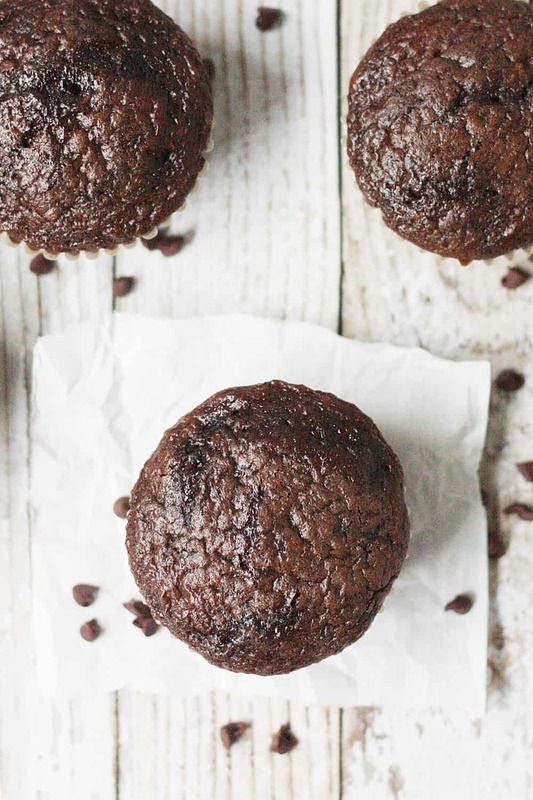 Keep in mind these double chocolate zucchini muffins are more light and fluffy than your typical muffin due to the cake mix. In fact, the texture is almost like a cupcake, but that didn’t stop me from eating my fair share before they’d completely cooled. 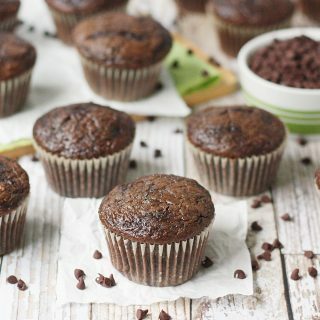 I prefer using kraft baking cups because I feel like they make zucchini chocolate chip muffins like these the star of the show. 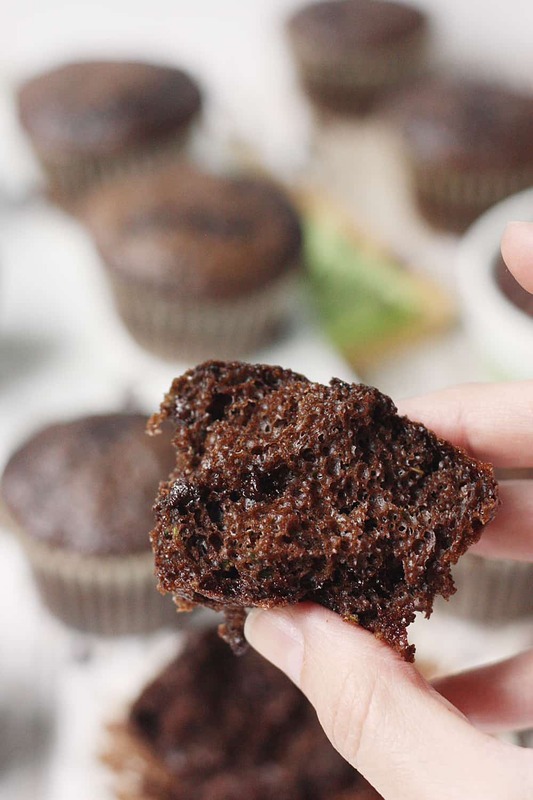 No flashy cupcake liners to distract you from all that moist, decadent, chocolaty goodness! Oh, and you’ll for sure want a large cookie dough scoop to fill that 12-cup muffin pan. It makes it super easy and creates less mess—two pretty awesome things. Preheat oven to 350 degrees. Line 12-cup muffin pan with cupcake liners; set aside. Combine Triple Chocolate Fudge cake mix, canola oil, milk, and eggs in a large bowl and beat on medium speed for 1 minute. Fold in zucchini and mini chocolate chips until thoroughly combined. Use a large cookie dough scoop to fill liners about 2/3 full (approx. 3 T of batter). Bake 14 to 16 minutes or until toothpick inserted in center comes out clean. Cool 3 to 5 minutes in pan before removing to wire rack to cool completely. Store in an airtight container at room temperature up to 2 days or refrigerate up to 5. These make such a great grab and go breakfast! No complaints from the kids with that double chocolate going on! Anything with double chocolate in the title is good with me. A great way to sneak some extra veggies in too. Those look so rich and moist and sound easy too. Wow! These beauties look so fluffy & chocolate-y. Bonus that they are nearly effortless to make. This sounds delicious and I love that you use a boxed cake mix! My daughter is allergic to eggs so I’ll substitute applesauce for the eggs for cakes and it usually does the trick. Do you think it would work with this recipe, or would it fall apart for not being binding enough? Oh my, I wish I knew. I’ve substituted applesauce for the oil but never for the eggs. Sorry! Zucchini and chocolate work so well together. I bet these muffins are so moist and delicious! These look absolutely perfect. I love chocolate and zucchini together. A pair made in heaven. Then you’ll definitely love these! Such a delicious combination. This recipe sounds amazing!